Every year by March 15th I start to think about hooded orioles. Because I know on April 1st I can go down to Hendry’s beach and find them in the parking lot high in a palm tree or low in a bush. This sighting is my welcoming to Spring! 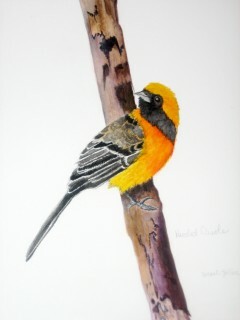 Here, I painted a hooded oriole for my friend, Laurie. I chose the hooded oriole to represent her because she is a red-head, plays a guitar and sings. A red-headed songbird indeed!